The 2018 omnibus spending bill passed by Congress halfway through 2018 allocated an additional $80 billion for defense and $63 billion for civilian agencies – many of which were spending frugally due to budget uncertainty. The result, according to NextGov, is a federal government rife with cash. With the government’s “use it or lose it” approach to funding, it’s ensured that agencies and military organizations will be looking to deplete what remains in their coffers this federal buying season in an attempt to not be saddled with fewer budget dollars in the coming year. Click the image above to download the full Federal Focus Report. This creates an unparalleled opportunity for federal agencies to truly do something positive and with lasting impact on their organization. Often, budget dollars spent during the federal buying season are directed toward IT solutions and technologies that can help government organizations increase their operational efficiency, better accomplish their mission and increase their effectiveness in the coming year. This means they’re effectively using their budget dollars during the federal buying season to embrace the new technologies that can help them spend less and do more into the future. And with more budget dollars available, the opportunity to make larger, strategic investments is greater than ever. What are the technologies piquing the interest of government agencies this federal buying season? 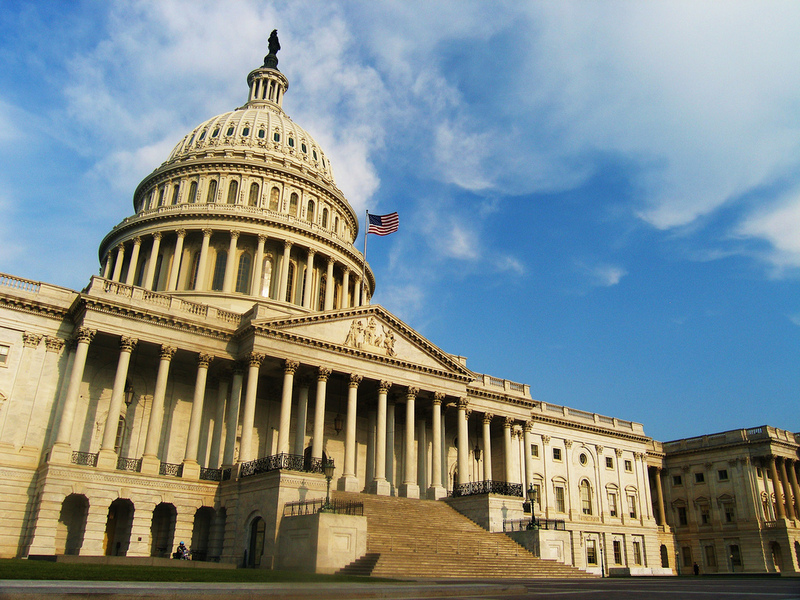 The recent Federal Focus Report from the Government Technology Insider could offer an answer. And that answer is…it depends on which part of the government the organization in question operates. According to the Federal Focus Report – which analyzed the reader analytics and metrics from Government Technology Insider to identify trends in the marketplace – organizations with the civilian sector and the military have slightly different IT priorities this federal buying season – although significant overlap exists. When you’re in the national security business, the stakes are really high. If an essential IT service or capability for the warfighter is denied, or if vital, top secret information is compromised, lives could quite literally be at risk. Figure 1 – Although cybersecurity commanded much of the interest and attention of the military last quarter, cloud and digital transformation remained major priorities for the DoD. Because of the high stakes that the military is perpetually dealing with – and the constantly shifting, evolving and adapting threat landscape that it’s facing – it should come as no surprise that cybersecurity was tops among the topics that drew military readers to Government Technology Insider. However, securing data wasn’t the only topic of interest for the Department of Defense. 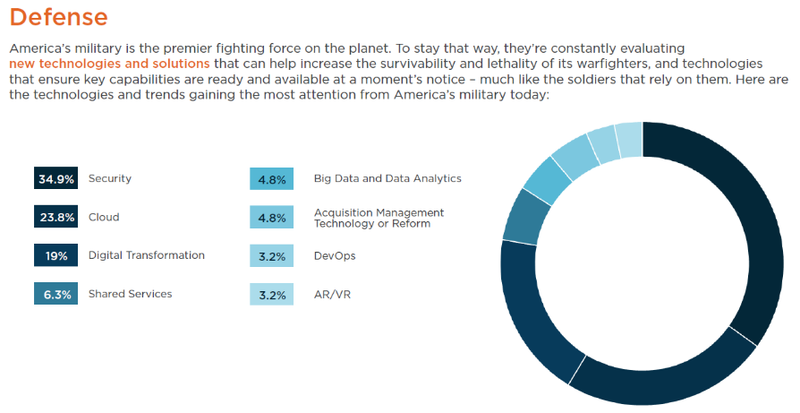 As you can see in Figure 1, a larger percentage of military readers were also interested in cloud and digital transformation – two topics that very much go hand-in-hand. Much of today’s military – and many other government entities outside of the DoD – are looking to modernize their outdated, legacy systems as a precursor to other, beneficial IT implementations. 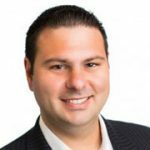 And a move to the cloud is not only a top-down mandate for these agencies – it’s also a positive step towards enabling them to embrace some of the other new technologies revolutionizing the way organizations do business today. Whether the military is looking to pursue Big Data and data analytics, artificial intelligence (AI) or Internet of Things (IoT) implementations in the future, modernizing IT infrastructures and moving into the cloud is an essential step to making many of those implementations a reality. These top three trends were mirrored in the civilian agencies that spent time on the Government Technology Insider, although the order was much different. 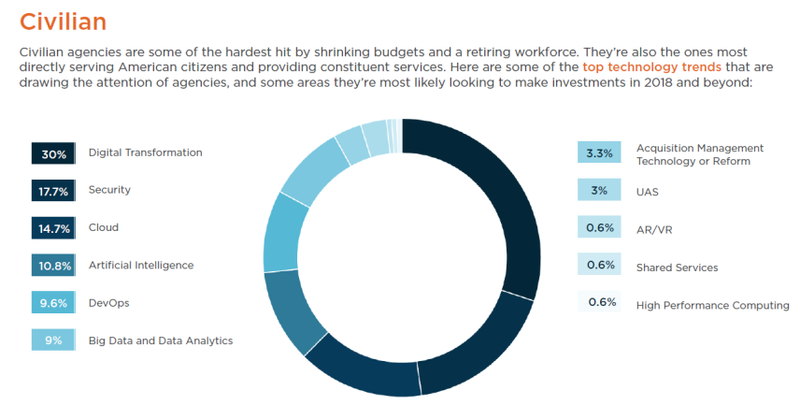 Regardless of mission, all federal government agencies face similar challenges on a large scale – fiscal uncertainty, aging workforces retiring en masse and a need to deliver constituent services, or accomplish a mission, with fewer resources – are the overarching trends. Because of this, it’s not surprising to see the same three technology priorities taking the top spots among civilian agencies and DoD organizations. However, the positioning of these three trends in the list is very telling. Figure 2 – Security isn’t the top concern for civilian agencies – although it is important. Instead, digital transformation dominates the interest and focus of civilian agency decision makers this federal buying season. As you can see in Figure 2, cybersecurity was a concern for civilian agencies, but not nearly as a much of a concern as it was for defense organizations. This could most likely be chalked up to the fact that defense agencies are facing increasingly active and sophisticated cyberattacks – and preparing for adversaries that will use cyber as part of military aggression in the future. Also, many civilian agencies took positive steps to reinforce their security posture following the massive OMB breach. However, the presence of cyber within the civilian top three indicates that protecting their data and networks is still a priority. The top spot for civilian agencies was the third most important for defense organizations – digital transformation. And that makes a lot of sense when you stop to think about it. Many of the technologies that we discussed previously – AI, data analytics and IoT implementations – are essential for automating offices and helping agencies do more with less. Although budget dollars and resources remain a challenge across the government, defense spending remains high – especially during the current administration. This could explain why digital transformation – a precursor to embracing many of those technologies – is the top priority for civilian agencies. More surprising is the presence of the cloud at number three on the list – drawing less than 15 percent of the civilian interest on the Government Technology Insider. Cloud mandates that came from the top-down impacted civilian agencies just as they did the DoD. However, it’s fair to assume that – at this point – civilian agencies may be ahead of the DoD when it comes to cloud adoption. With, perceivably, fewer security concerns and less of a national security risk, civilian agencies have been able to more rapidly embrace the cloud – while a similar move needed to be much more disciplined and deliberate within the DoD. 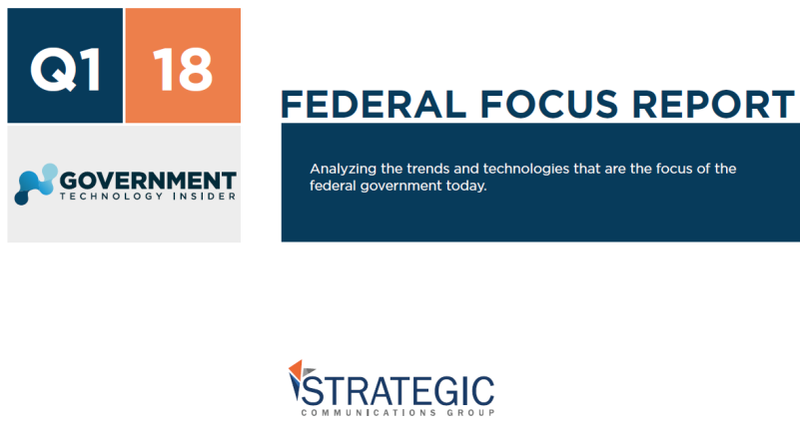 To learn even more about the IT priorities and interests of federal government agencies and organizations this federal buying season, click HERE to download the full Federal Focus Report.